One minute I'm happy with how this one is going, the next I hate it and want to ditch it to start something else! Will I ever learn to be more patient with the rough early layers of my paintings?! Probably not! 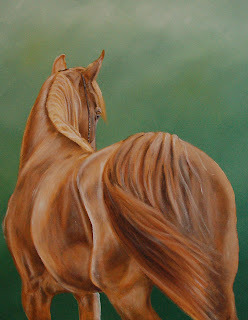 I made a start on a new painting this week, this one features a beautiful young chestnut I saw competing in hand at the Northern Arabian Horse Show last weekend. 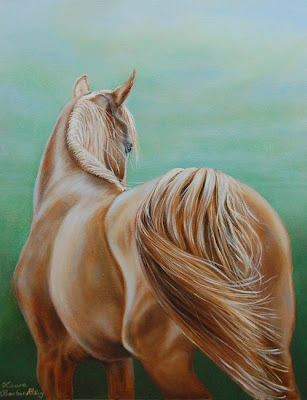 My visit to the show was a fleeting one but I took away lots of wonderful reference material to paint from; the weather was fantastic and the horses breathtaking. I have been longing to paint an Arab for ages so I'm excited about getting going with this one. 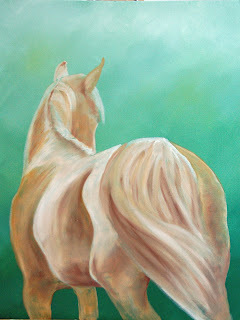 I am working on a deep canvas this time, 20" x 16" (50cm x 40cm ish). 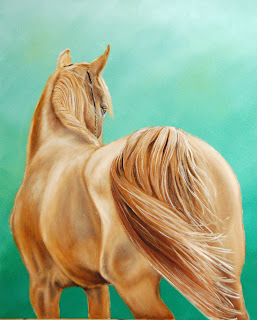 I have tried something a little different this time and blocked the whole canvas in the background colour before sketching the horse over the top- I am reserving judgement as to whether it helps or not! The green is brighter than I wanted it so I suspect it will be get painted over anyway eventually, nevermind! Just the first sketchy layer of paint down so far. The green background forced me to be a bit bolder with my first layer, will be interesting to see if it makes a difference to the finished result. 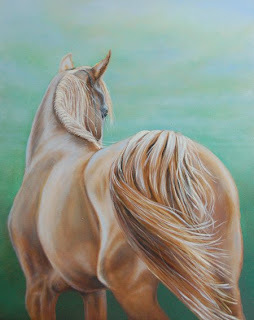 Another painting finished. 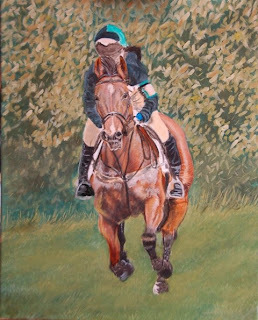 I have renamed the piece 'Between Fences' as 'Gallop' wasn't a particularly inspired title! A bit more on this one today. 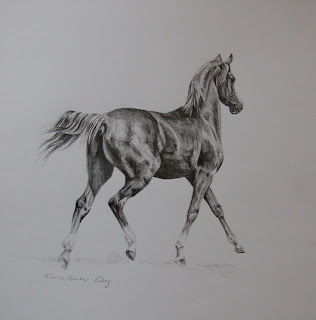 I have recieved my pre-selection results from the Society of Equestrian Artists! I am over the moon that one of my paintings has been deemed worth taking along to the judging panel at the Mall Galleries London in July! 'Acquiescence' did well in the scoring, 'Rocket Science' had a mixed response, while 'Washing Down' wasn't thought to be quite at the required standard. I plan to take Acquiescence to London and will probably take Rocket Science too to try my luck with it, figure I have nothing to lose! Of course, a positive response at pre-selection does not mean the work will be accepted into the exhibition but the results have really encouraged me and put a huge smile on my face. I have only been painting for 18 months now so to have feedback that some of my work is potentially good enough to be hung with some of the best in the country is such a boost. I'm very grateful to Ann and Helen Heffron who kindly allowed me to work from some of their beautiful photographs to create the paintings. Finally this one is starting to come together a bit more! The paler leaves over the top of the shadows have made a real difference. Still plenty to do but I'm feeling much happier with it. I'm managing to get bits done here and there on it while waiting for commissioned paintings to dry between layers and hope to have it finished before too long. I was looking forward to a trip to Appleby Fair with my camera tomorrow but the weather forecast is dreadful, fingers crossed for a reasonably dry day! What a beautiful sunny start to June! 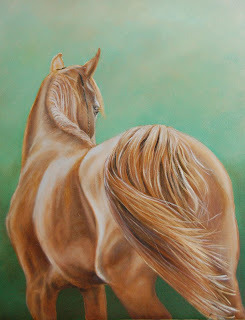 Today marks the deadline that I have been working towards with my original work so far this year- it is the closing date for the Society of Equestrian Artists Annual Exhibition. Months of morning sickness scuppered my plans and set me back quite a bit but after a busy month I did manage to get three paintings completed and submitted- 'Aquiescence', 'Rocket Science', and 'Washing Down'. I will now have to wait and see how the paintings fare in the pre-selection process, where photographs of my work will be assessed and either deemed worth bringing along to be seen by a panel of selection judges at the exhibition in London, or rejected. The process is more of a pre-rejection process in reality as acceptance at this stage is no guarantee of actually being accepted in London- but saves newer artists like myself from making a completely wasted trip to London if the work is not quite at the required standard yet. The standard of work at the SEA exhibitions is incredibly high, and wall space at the exhibition limited so the odds of work being accepted are not good! You don't know until you try these things though so I'm keeping my fingers crossed and if I don't get anything in this time I'll be back to try again next year! So, back to commissions! 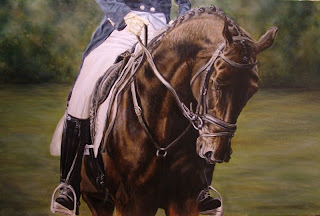 I'm starting a new commission in oil today, along with several pencil portraits. 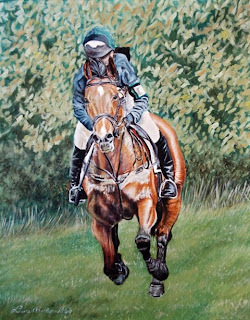 Original work will be taking a back seat for a while while I focus on commissioned work however I have several exciting excursions with my camera planned including Appleby Fair next weekend, and Bramham Horse Trials the weekend after- can't wait! I will be hoping to get lots of great photographs to use as reference material for future paintings. 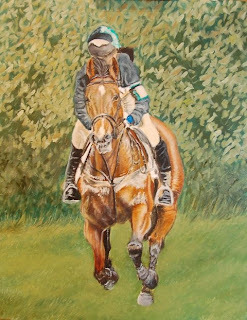 I was busy enjoying the sunshine for much of the weekend but did manage to finally at long last get some basic background colour blocked in on the 'Gallop' painting! It is still at the ugly stage where all the colours look horrible and the painting rough, hopefully in the next few layers it will start to come together.